Figure 1. The Velero IV (Photo credit: Ryan Fields). Did you know that fish make sounds? They do! Some fish species, like the rockfish you eat in your fish tacos, are soniferous (sound producing). Fish produce a drumming sound by striking the gasbladder (swim bladder) and the sonic muscle together. Rockfish (Genus Sebastes spp.) are a genus that produce low frequency sounds associated with agonistic interactions and territorial defense. Due to this ability, it is proposed that rockfish may elicit an acoustic response due to increased noise produced by survey vehicles used to study rockfish populations. This concept fueled NOAA’s desire to deploy hydrophones to record survey vehicle operations in Southern California and rockfish in these areas. This acoustic work was one component of the Untrawlable Habitat Strategic Initiative (UHSI) SoCal Project, a collaborative effort between NOAA Northwest, Alaska, and Southeast Fisheries Science Centers. The goal of the 2-year project was to assess rockfish response to survey vehicles and determine the biases in studying rockfish using vehicles such as AUV’s (Autonomous Underwater Vehicles- like the one displayed at the SEC) and HOV’s (Human Operated Submersibles). Cruises were conducted in the Channel Islands in October 2016 and this last month in October 2017. Last year I was a data analyst for the project but this year, I got the opportunity to be a part of the research team onboard. I worked along scientists from the SWFSC Fisheries Ecology Division in Santa Cruz, CA and NWFSC Fishery Resource Analysis and Monitoring Division in Newport, OR. 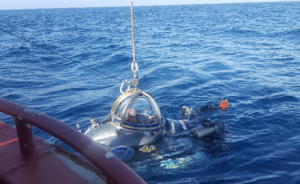 My role was to handle all operations for the 3 hydrophones we deployed along with a variety of sensors including a turbidity meter, light sensors, and accelerometers. The cruise was 2 ½ weeks long and the longest duration of time I had ever spent at sea so I was excited to get away from land for a bit and live on a ship for 18 days! The ship that would be my home for the next 2 ½ weeks was the Velero IV (Figure 1), a shipping vessel from Seattle, Washington that had been modified for this project. An extra sleeping quarters had been transferred onboard as well as a lab for the scientist that consisted of a one room cubicle with benches that they had placed on the ship using a crane. We spent the first day docked in Ventura Harbor preparing the platforms we would be deploying. 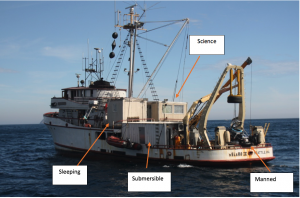 The 3 platforms (Figure 2) (each named after a different Fisheries Science Center) were fitted with DIDSON imaging sonar, that produce images of the fish used to quantify species and measure fish lengths. 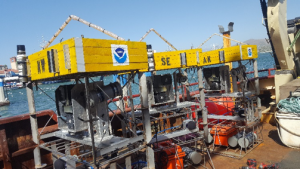 MOUSS cameras were also placed on the platforms which took pictures every 2 seconds and are used to assess fish movement, species diversity and abundances. While the research team worked on putting together the platforms, the submersible team was hard at work preparing the DeepWorker manned submersible which would be used to deploy the platforms on the sea floor (Figure 3). We departed from Ventura, CA on October 9th and set out to sea at sunset. I was nervous at first, wondering what the conditions would be like especially since I am prone to seasickness but fortunately, almost every day was beautiful and calm in sunny Southern California. There was no need for my phone alarm in the morning because between the loud clanking of the anchor being pulled up and the smell of bacon, we were always up by 6:30am. The Velero IV would leave Smuggler’s Cove off Santa Cruz Islands and after a short journey to our survey area would arrive at site at 7am. Our survey area was Footprint Bank, an area between Santa Cruz and Anacapa Island where 3 sites had been determined as locations to deploy the platforms. Once on site, the science team turned on all devices, placed them on the platforms and then with the help of the crew and sub team, the platforms were lowered over the side of the vessel. The sub attached a line to the platform using a metal claw that would allow the platform to be descended to the bottom (Figure 4). Once at the bottom, the sub operator would un-attach the line and we would then continue to the next site. 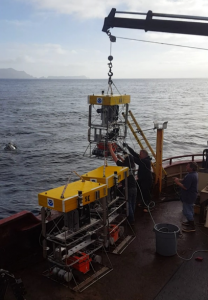 After all 3 platforms were deployed we would leave the area and return to Smuggler’s Cove for a 3-hour period while the NOAA Shimada vessel conducted AUV flybys and seafloor mapping. At approximately 3pm we would return to Footprint Bank and the sub might conduct some flyby passes near the platforms prior to retrieving the platforms before sunset. Figure 4. Deploying the Alaska platform one morning. The sub is in the water preparing to take the platform down to the bottom. Throughout the day we would always see marine mammal. I was the only marine mammal scientist onboard so if marine mammals were sighted, the crew and research team always called me to the top deck to identify species. We saw pods of bottlenose dolphin, long-beaked common dolphin, Risso’s dolphin and an extremely active lone humpback breaching and tale slapping one day. After we headed back in and anchored in Smuggler’s Cove for the night, I would go up to the bow of the ship to see the “show”. Bioluminescence glowed green in the water and even in the middle of the night you could see sea lions chased schools of fish and track the movements underwater as their bodies glowed green…it was like Fourth of July in October! One night, as we were heading into Santa Barbara to anchor up for the night, I was looking at the water from the top deck when suddenly, I saw these green glowing torpedoes moving in the water near the bow of the vessel, spinning and crossing each other as they glided through the water. I went down to the bow to get a closer look and saw they were dolphins bow riding! The bioluminescence in the water was causing their torpedo shaped bodies to be outlined by a green glow which allowed you to see their every movement in the dark water. It was the most amazing thing I had ever seen! Rockfish are a dominant demersal fish species in benthic ecosystems and are of recreational and commercial importance in California. The UHSI project is important as it will shed light on some important implications for ground fish research and the anthropogenic impacts on these species. I was grateful to have the opportunity to be involved in the data collection process, so I could gain a better understanding of the project and perspective on the data. Going out to sea makes all the long hours of analyzing data and staring at a computer screen worth it! Welcome to the new VEL site! The vertebrate ecology lab is excited to present our new website! Learn more about the current research projects taking place and what it’s like to be a student in the vertebrate ecology lab at MLML. Stay tuned for regular blog posts from students about their research and other happenings as a graduate student!